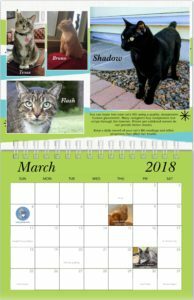 We are now accepting orders for the 2019 8.5″ by 11″ full-color twelve-month DCIN Extra-Sweet Kitties wall calendar! The prices listed below include mailing costs. 1) Choose the “Send & Request” button at the top of the PayPal page (after you log in). 2) Enter calendar@dcin.info in the account field. 5) Use the “add a note” box below the donation field to give us the number of calendars ordered, the mailing address, and your email address. 7) Choose if you are going to pay with your linked account or with a credit card – **Please choose to pay the fees associated with a credit card so DCIN does not have to pay them**. Canadian mailings — $32 per calendar – please pay in US$! Other international mailings –– $37 per calendar – please pay in US$! The higher costs for Canada and other international locations are because of the higher mailing costs to those places. DCIN is accepting orders for the 2019 calendar through December 8, 2018 (HARD DEADLINE). Thank you all so much for supporting DCIN’s 2019 Extra-Sweet Kitties Calendar! If you have questions, please contact me at amy@dcin.info.